When I think about comfort food, rice pudding rates right up there in my top 5 picks. That being said, there are certain elements I look for in a great rice pudding. It must have a golden-brown, blistered surface, sprinkled with a mixture of cinnamon and fresh nutmeg, next a thick creamy layer of custard, preferably made from farm fresh eggs, and finally tender brown Jasmine rice with plump sweet raisins. It doesn't get any better than that! 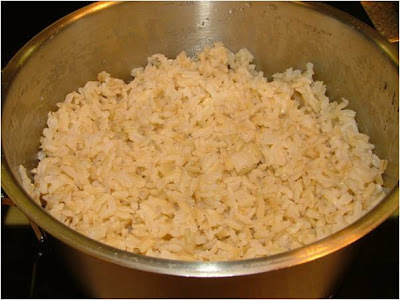 To save time I cook my rice a day ahead of time, making enough brown rice to use in a main dish with enough left over for a batch and a half of my favorite rice pudding. Original recipe from Lisa Holderness, Food Editor of Better Homes and Gardens. You can vary the type of rice, sugar and fruit in this versatile stir-together dessert. Making it ahead and serve as an amazingly tasty breakfast, especially when drizzled with milk. Bonus: It's low in fat and calories. PREP: 15 minutes BAKE: 50 minutes OVEN: 325degrees F.
In an ungreased 2-quart casserole or ovenproof bowl combine eggs, milk, sugar, vanilla, and salt. With a whisk beat until combined but not foamy. Stir in cooked rice and dried fruit. Place casserole in a 3-quart baking dish on an oven rack. Pour boiling water into baking dish around the casserole to a depth of 1 inch. Bake in a 325degree F. oven for 30 minutes. Stir well; sprinkle with nutmeg and cinnamon. Bake for an additional 20 to 30 minutes more or until a knife inserted near the center comes out clean. Serve warm or cold with milk or half-and-half. To serve cold, cover and chill. Pee-Wee, Americauna, Brown and Dinosaur Eggs? Baked Rice Pudding in hot-water bath. *NOTE: Rapadura is an organic, unrefined cane sugar. It has a slight caramel flavor and color. For this recipe, do not use the larger-grained raw sugar, as it tends to sink to the bottom of the bowl. This rice pudding must be eaten warm from the oven to experience an unbelievably tender custard! Eating this pudding cold with give you a totally different dining experience. Both will bring comfort to your senses! It doesn't get better than this! Look at that creamy custard layer! Are your chickens laying like crazy and you have more eggs than you know what to do with? Why not make baked rice pudding? That's what we do . . . Over at Julie's. Isn't it time you baked up a bowl of Comfort? Thank you for this recipe. I saw the original in an old magazine but someone tore out the recipe. It sounds so yummy. I can't wait to try it. Your muffin recipe sounds wonderful, too! You're very welcome! I have the original recipe cut from an old Better Homes and Gardens and this recipe is by far the best rice pudding I've ever eaten! Both muffin recipes I've published are winners! Hope you enjoy them.